It is always a bit of a challenge to keep current with the bevy of fabulous wines that emerge from Piemonte’s top estates. Readers will find a huge assortment of wines in the market. This article covers the 2009 and 2010 vintages in Barbaresco, late-release 2008 Barolo, new releases from Roero and Piemonte’s northern appellations, and a wide range of every-day drinkers that won’t break the bank. The vast majority of these wines were tasted in Italy in August 2012, with follow up tastings in my New York office in September 2012. No matter how many times I have been to Piemonte, I never tire of the spectacular views, fabulous cuisine and wide array of superb wines that capture the essence of one of the most genuine, down to earth, artisan wine cultures on the planet. Readers will find two very different vintages in the 2009 and 2010 Barbareschi. The 2009s are the result of a year with very hot summer temperatures, while the 2010s emerge from an exceptionally long, cool growing season. In other words, the vintages are nearly polar opposites. At the time of my tastings, virtually all of the 2009s had been bottled, while the 2010s had been bottled for anywhere from a few weeks to a few months. I will revisit the 2010s later this year, so notes on those wines should be taken for what they are – previews of a big vintage that is likely to develop considerably over time. The 2009 growing season was characterized by a snowy winter and wet spring with unseasonably cool weather. Temperatures heated up in June. A protracted heat wave set in during the middle of August. I remember that time well, as I was on vacation with my family in Tuscany. The middle of August is usually a time when daytime temperatures begin to lower, but, more importantly, a period when evening temperatures drop. None of that happened in August 2009. Readers might remember from previous articles that diurnal shifts are an absolutely critical element in achieving full phenolic ripeness and good color in Nebbiolo. In 2009, the heat was stifling to the point some plants shut down, leaving the stems and grapes with tannins that never fully ripened The overall maturation cycle in 2009 was also a bit shorter than optimal. The first thing that is clearly evident about the 2009 Barbareschi is that they lack color. Of course, Nebbiolo is not a grape with tons of pigment, but still, young Barbareschi should have darker (yet translucent) tonality than is found in many 2009s. There are several factors that might explain the lack of color in many wines. The first of these is the mid-August heat spikes mentioned above and the ensuing stress placed on the vines. 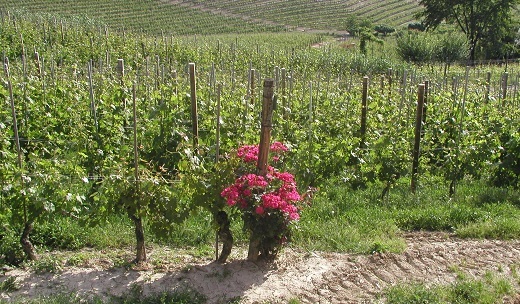 The usual criticism in Barbaresco is that on average yields are too high. In 2009 excessively high yields caused even more problems. Growers had to have the discipline to lower yields and leave the vines with only the amount of fruit that could be taken to full maturity. Grapes that weren’t fully physiologically ripe presented even more problems in the cellar. Destemming Nebbiolo is challenging. The stems and jacks are very fragile, which means a small percentage always ends up in the tanks. But when fruit is not fully physiologically ripe, the stems and jacks don’t separate as cleanly from the grapes, therefore more stem material ends up in the tanks, which has the effect of weakening the intensity of color. Vintage 2010 is another story entirely. It is a year characterized by a very long growing season – one of the longest on record – and much cooler weather with no heat spikes. All it takes to understand how important ideal conditions are for Nebbiolo is to taste the young 2010 Barbareschi. The best wines are simply stunning, with virtually no perception of tannin and phenomenal balance. Stylistically, 2010 is much like 2004, but with more density. The 2010s are of course young, but what I have tasted so far has been very impressive. It is quite possible 2010 will turn out to be a truly great, iconic vintage for Barbaresco. The 2008 Baroli continue to be hugely promising. Many wines are starting to shut down post bottling, so readers will want to try to catch the wines before they become totally impenetrable. I can’t remember any recent vintage that was this austere when young. The exception is perhaps 1999, although those wines always had tons of density and sheer heft. The 2008s aren’t like that at all. They are much more mid-weight Baroli, but with tons of underlying structure. In many ways, 2008 sounds the way old-timers describe the classic vintages from the 1970s and early 1980s, all of which I was too young to taste when they were first released. It is a vintage that will thrill classicists. Overall I place 2008 just behind 2006 and 2010, the other recent vintages that are built on important foundations of structure. Of all the regions within Piemonte, the most disappointing is Roero. Frankly, many of the Roero wines showed extremely poorly this year. I am not sure why, but even estates I hold in very high regard presented wines of little interest. There are a handful (but no more) of producers who are consistently excellent to outstanding – Correggia, Hilberg-Pasquero and Almondo come to mind – but the rest are unfortunately hit or miss. Roero is loaded with great terroirs for both whites and reds, but many estates have yet to find consistent excellence. While most consumers focus on Barolo and Barbaresco, the vast majority of estates also make delicious entry-level wines. That is especially true of the elite producers, most of whom don’t miss a beat throughout their entire lineup. You would think Dolcetto is a four-letter word, given how hard these wines struggle in the market. The best versions are full of flavor and character, and also frequently cost less than $20 a bottle. The 2011s represent a nice stylistic middle ground. They aren’t as mineral-driven as the 2010s, but also not as ripe as the 2009s. Barbera is perhaps even more versatile than Dolcetto because it can handle a wide range of winemaking choices. The 2011 Barberas that are in the market are mostly of the unoaked variety, and they are delicious for their plummy fruit and vinous exuberance. The top 2010s are now becoming available. As mentioned above, 2010 was a very long and cold growing season, so readers should expect to find Barberas built on tension, minerality and acidity. Although a few wines are a little light, in my view the best 2010 Barberas are simply stunning. Piemonte’s northern appellations are sadly often left out in serious discussions of Piemonte wines, where the vast majority of interest centers around Barolo and Barbaresco. That is a mistake. Each year I taste more and more wines from these tiny appellations that deserve serious attention. I encourage readers to check out the wines of Carema, Gattinara, Lessona and Boca, where Nebbiolo and Nebbiolo-based wines are distinctive and full of personality. Thankfully, the traditional versus modern debates of ten years ago are largely a thing of the past, as most people now realize there is a large measure of conversion taking place in Piemonte’s top estates. Today it is impossible to ignore a general trend of rediscovering traditionally-minded producers, many of whom had been unjustly neglected in the recent past. That is quite a change from the mid-1990s, when I first started visiting Piemonte. Back then the ‘super-Piedmont’ blends that added international varieties to Nebbiolo and Barbera were the highly allocated wines everyone fought over, Barolo/Barbaresco took several years to sell through a vintage, and French oak was all the rage. Today, the pendulum has swung completely in the other direction. The “super-Piedmont” category is dead in the water, and the best Baroli/Barbareschi sell through much more quickly. The traditional large cask or “botte” has made a major comeback. It is now obvious that some of the high-flying modern wines did not live up to all their promise. The French oak that was supposed to “integrate” over time never did, because wines have to be in balance when they are young to age gracefully. I believe the greatest legacy of the modern school won’t be the French oak-aged Baroli and Barbareschi many of us have in our cellars, but rather the undisputed fact that the leading producers in the 1980s introduced several innovations to Piemonte. Chief among these were the importance of green-harvesting and greater cleanliness in the cellar, concepts that elevated not just the modern wines, but all wines, to a consistently world-class level that was previously unattainable. So, while today it is tempting to be critical of the more modern wines, the truth is that the experimentation of the 1980s and 1990s in Piemonte was just part of a normal learning process that was also taking place in other parts of the world. Once a poor, agrarian region that young people sought to escape, today Piemonte is a much more vibrant and prosperous place that attracts visitors from all over the world. It was the French oak-aged, flashy wines of the 1990s and the ensuing attention of the world’s most discerning consumers that made today’s economic reality possible.